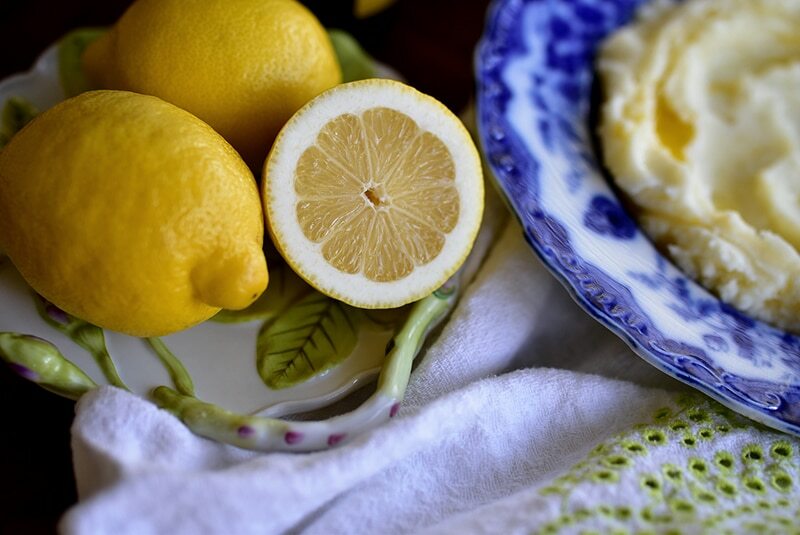 Home » Rose Water & Orange Blossoms Blog – Fresh and Classic Lebanese Recipes » Stories and Recipes » Gluten-Free » Irish Mashed Potatoes. In the Lebanese Way. Healthy mashed potatoes! Use garlic, lemon, and olive oil to ramp up the flavor of these potatoes. A great change from the usual high-fat mashers. I consider myself an honorary Irishman for a bunch of reasons. First, my name (Maureen). Second, my sister’s name (Peggy). Dan likes to call me Irish, but he doesn’t know I like it too. I have a whole clan of cousins who are, yes, half Irish. Beyond that: my siblings and I all went to school in South Bend, where you are Irish even if you’re really there, like I was, to be a Saint Mary’s Belle. I’ve spent many a Saturday with green clovers on my cheeks and “Go Irish” on my lips. I do believe if you ask my brothers what their nationality is, they might utter “Irish” even though their blood is pure Lebanese. I lived, too, in Chicago for a lot of years. Need I say more? Okay, I will: I loved its Irish-ness, an aura that permeates the city with jovial people, a green river in March, and a parade in the grand style (which I did not attend—ever—but was happy for the ones who did). In my offices there, people were plenty Irish. They brought Irish soda bread to meetings, talked in fake Irish brogues informed by experience, and loved to tell stories and laugh. My first trip abroad was not Lebanon, but Ireland. Those rolling emerald hills, the gentle people, the thatch-roofed villages . . . I was smitten, and never quite lost it. But the thing that makes me most Irish of all? My finesse with the potato. My mother showed me and my Irish sister long ago how to peel a potato swiftly, in just a couple of passes at the thing with a paring knife. None of our kitchens has ever seen a potato peeled with a vegetable peeler. You pull the knife edge back toward the thumb to cut away the peel, and it looks to most anyone watching as though we’re going to cut right through and have an E.R. trip on our hands. Never happened, never will, because there is so much tension as you peel that the knife is easy to control and hold to its task. We take off that skin in less than three peels. We do it with garlic. We do it with lemon. 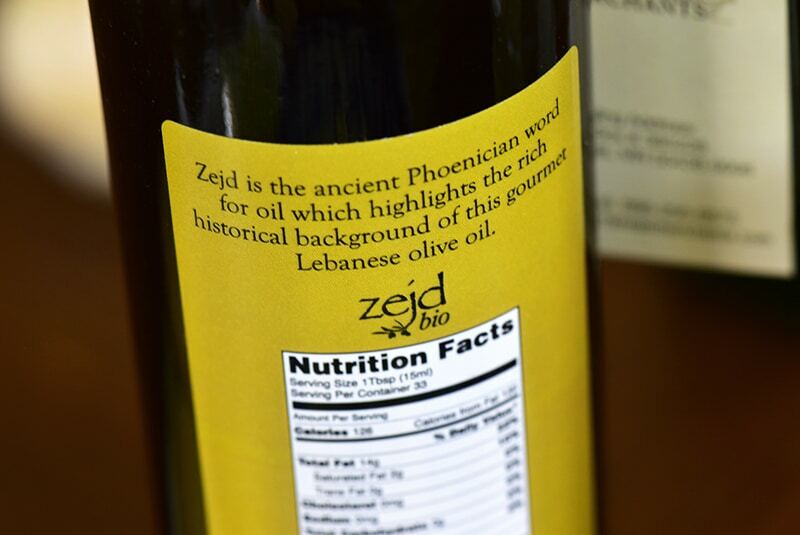 We do it with olive oil. There is a classic spicy Lebanese potato dish, batata harra, that is fried cubes of potato doused in lemon, oil, cilantro, and chili flakes. I love this dish and it is in my cookbook. My mashed potatoes echo the taste of the Batata harra, without the frying or the fuss. 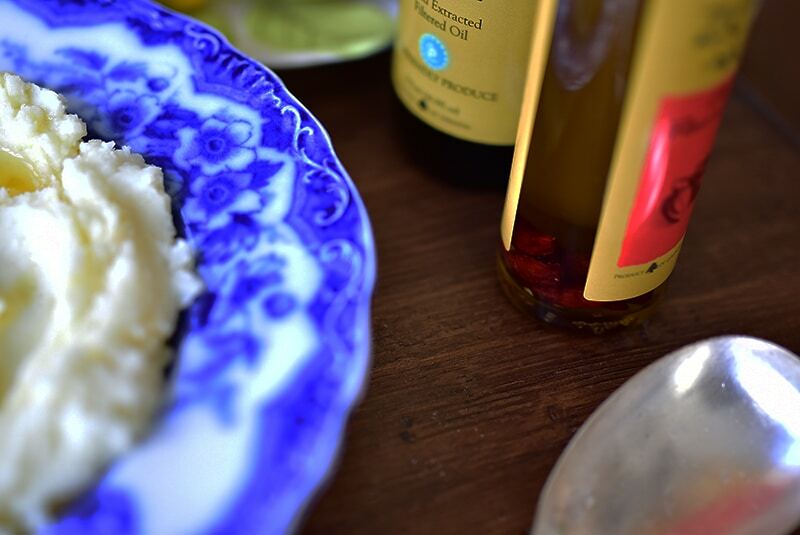 It can be as simple as drizzling hot chili oil over your mashed potatoes (it’s one of the main reasons I started using, and now offering, our imported Lebanese Hot Chili Olive Oil). Adding garlic to the mix when the potatoes are cooking is a game-changing move! Just mash them together with the potatoes when it's time. Make the potatoes vegan by leaving out the labneh and replacing with a little more oil or almond milk to smooth out the potatoes. Peel your potatoes, cut them into large chunks, and get them into water right away, otherwise they’ll turn brown. In a large pot, cover the potatoes and the garlic with cool water. Salt the water with 3 teaspoons of salt. Bring to a boil and cook over medium high heat the potatoes are tender and a sharp knife tip inserted into them meets no resistance, 20-25 minutes. Drain the potatoes. Be sure to get every breath of water out of them by placing the drained potatoes in their pot, then back on the warm burner to let any remaining water steam off. Do this quickly and stay close though, to be sure the potatoes don’t start to brown. Using a potato masher (or a ricer or hand mixer if you’re after ultra-smooth), mash the potatoes with the garlic and lemon juice, a couple of tablespoons of olive oil, and laban. Taste and add more lemon, oil, and/or laban to get the potatoes to the consistency you enjoy. Taste and season with salt. Spread the potatoes in a shallow dish or spoon into a bowl. Drizzle with the chili oil and serve immediately. 17 Responses to "Irish Mashed Potatoes. In the Lebanese Way." Thank you, Maureen! This looks really easy to prepare and is surely as delicious as everything you post. I would really, really like to see a video of how you peel potatoes in your family. It sounds like one of those life hacks that make everything easier. I use a vegetable peeler and would love to learn this technique from you! 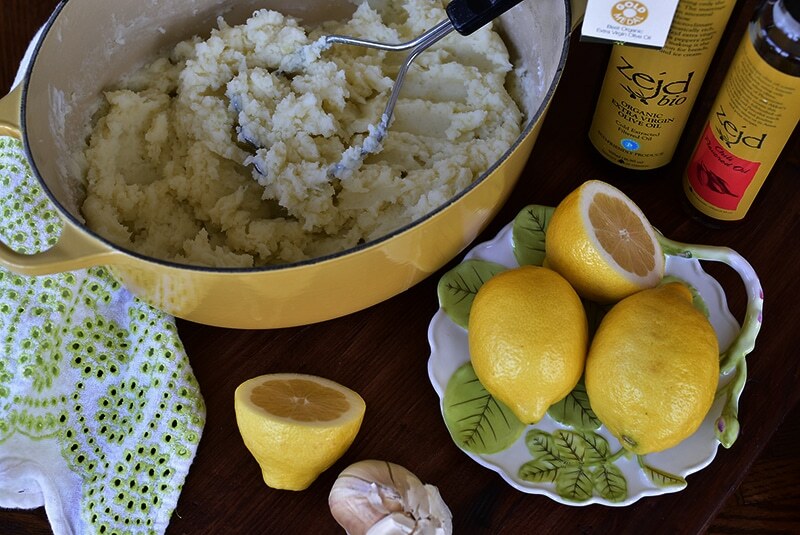 I have never used lemon juice in mashed potatoes before but I will try it the next time I make them. And using laban instead of milk sounds good to me. Question: Do you mash the cooked garlic with the potatoes? I am guessing yes since they are cooked with the potatoes. I appreciate and enjoy your blog — it is Great! Looking forward to your next book. I am of a mixed heritage that does indeed include Irish ancestors but married into a full blooded Lebanese family (you never marry just your spouse; you marry the whole family and that is a good thing). I am very glad to let you know that this May 2016 we will celebrate 55 years of marriage. Wonderful comment, thank you! And yes, mash the garlic together with the potatoes. Delicious. I would love to see a video of your potato peeling skills. Love your blog. Thanks, as always. I always enjoy your recipes; I have your book and I print out all of your recipes to try. Every one I’ve tried has become a favorite. Stay well, and Happy St Pat’s Day! Maureen I love your recipes, stories, and photography. Could we see a video of the potato peeling with a knife? My mother also used a knife and I do as well. I did purchase a potato peeler but find it awkward to use. When people seee using a knife they feel I am wasting potato. Would welcome a video or pictures. The potatoes sound delicious. Cant wait to try them. As always thanks for sharing such great receipes. My Mother’s maiden name was Nellie Kelley, but she was Lebanese as was my Dad. You can imagine what fun I had with that, especially when I flew as a stewardess on Eastern with a Sullivan and an O’Sullivan…my maiden name is Smaha! Will do the mashed potatoes this weekend. Did the stuffed cabbage last week. Yummy! I agree wiht the other comments; please load a potato peeling video! 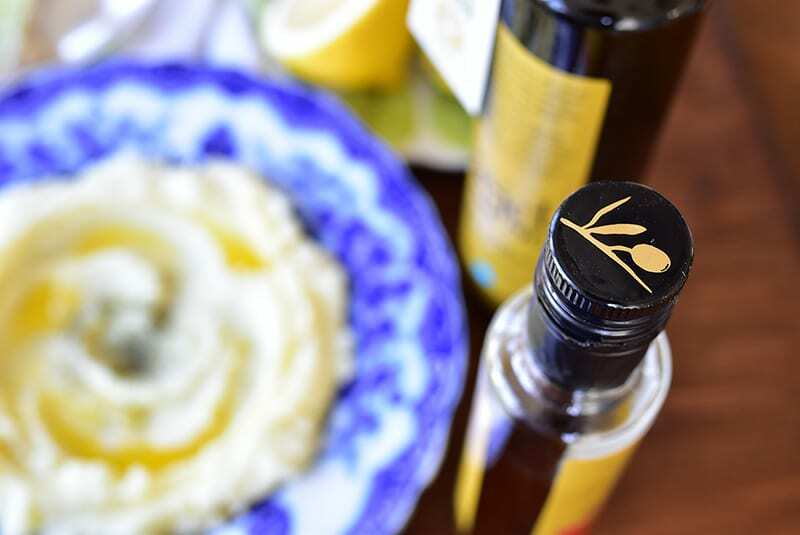 I have lemon-infused extra virgin olive oil, bet it will work well in this recipe! Maureen–I love this recipe! I am half Irish, half Lebanese (and full on food lover!). I feel like this recipe honors both of my parents, while making my taste buds and belly quite happy! I also love that the recipe is dairy free. Thank you!!!!!!!!!!!!!! That’s so great Cathy!! Enjoy every bite! I meant to say dairy LIGHT not dairy free! Whoops! I guess I got too excited about the recipe!!!!!!!!!!!!!!!!!! Could you use vegan yogurt or would it turn out strangely?? Having regular yogurt or labneh in the recipe keeps it from being vegan. Thanks! Oh thank you Angela–the recipe should read that the labneh is optional for vegan; just fixed it. While I haven’t tested with vegan yogurt, you might try almond or soy milk. Or just leave that out altogether and increase the oil.